This is a mixed one for me. The cover versions of pop songs sound a bit trite to me, like Brasil '66 Vol. 2. But the Brazilian tracks are indispensible. I tend to play only "Saiupa," "Boa Palavra," "Veleiro" and "Cancao do Sal" on this album, and they make me wish they'd done more of the same. Their follow-up Blue Thumb album also has some highlights--they do a unique arrangement of "Spinning Wheel" in 7/4 time, reminding me more of Mendes's more inventive arrangements on the Brasil '66 albums (such as "Norwegian Wood"). Plus, they cover "Zazueira" on that record. Interesting that the English translation for "Cancao do Sal" is wrong--I believe it is "Salt Song" (aka salt workers song, related to salt mining), as I've seen this song listed elsewhere (including on Milton Nascimento's own album, Courage). It would be nice to know what happened to Manfredo Fest's planned solo album, SP 4193. I've got a promo copy of a single, "Misturada"/"O Ovo (the Egg)" on A&M. His instrumental albums for other labels are quite interesting too. Fest had some excellent albums on the dmp Records label. I felt that his debut album there, Braziliana, was the best of the bunch. I believe he also recorded for Concord after leaving dmp. I've used Braziliana as a demo disc when auditioning audio components. It would be nice to know what happened to Manfredo Fest's planned solo album, SP 4193. I've got a promo copy of a single, "Misturada"/"O Ovo (the Egg)" on A&M. I remember hearing a couple of songs from the album on the radio and putting it at the top of the list to buy the next tie I was at a record store. The sound was so close to Brasil '66 that I just naturally went for it. Finding out that the album was not only on A&M, but produced by Sergio Mendes made it all the more appealing. Today, given the fact that Gracinha Leporace has graced so many of Sergio's albums, it really *is* like another Sergio Mendes album. Though the cover songs grabbed be early on, today I'd list "Saiupa" as my favorite. Sergio told me A&M pulled the plug on the Fest album, he didn't say why. There are a ton of gorgeous Fest releases from Brasil, I highly recommend all of them. The one I really want is Brazilian Dorian Dream. A few of the songs on that album he would re-record on this dmp Records releases, including the title track, "Facing East" and "Jungle Cat." You'd think with all the attention A&M's Brazilian music has gotten in recent years, that they would have issued the Fest album. Thing is, how many (except ardent A&M or Fest fans) even know it exists in the vaults? There's actually no album, just the two sides that were released as a 45, at least that was my understanding. This is one album that I've thought about getting for some time, but kept putting it off and forgetting about it. From the clips I've heard on YouTube, I like their sound. It's different from SM & B'66 and has its own verve to it. I'll have to make a point of getting this for Christmas. How I love this album (and the followups which were not A&M). I appreciate the latin inflected covers of American pop tunes too. It was all part of the package. ... and many more! I'm blanking out on other artists at the moment (I'm at work away from my collection) but I picked up a lot of this stuff while in Tokyo this past summer and I'd be happy to share a more comprehensive list by PM. I've wanted to find that album by The Carnival (essentially, a few members of the original Brasil '66 line-up, post-Sergio). Luckily there are some sealed copies on vinyl still out there. One thing bothering me in recent years is that the English translation of the last song should be something like "The salt worker's song", not "sultry song" which is totally wrong. I have seen this track done by others with a more correct translation, and roughly translated, the lyrics speak of working in the salt mines. I didn't make the connection until now. I was listening to the Moacir Santos album Coisas, and after about two minutes of "Coisa No. 5" I started to recognize the melody. Sure enough, in the credits, he is listed as the composer of "Nana" on this album. Mario Telles would have done the vocals--the Coisas (roughly translated as "things") are all instrumentals. Of course, "Ratatouille" on Herb's Coney Island is a remake of "Coisa No. 1" (although Herb's rendition draws a lot more from the Baden Powell interpretation than Cantos' original). 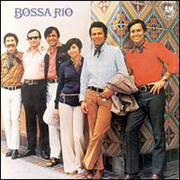 The BOSSA RIO album is available on Amazon for streaming as of right now, anyway. Qobuz also has the first Bossa Rio album. Nothing on Alegria though.